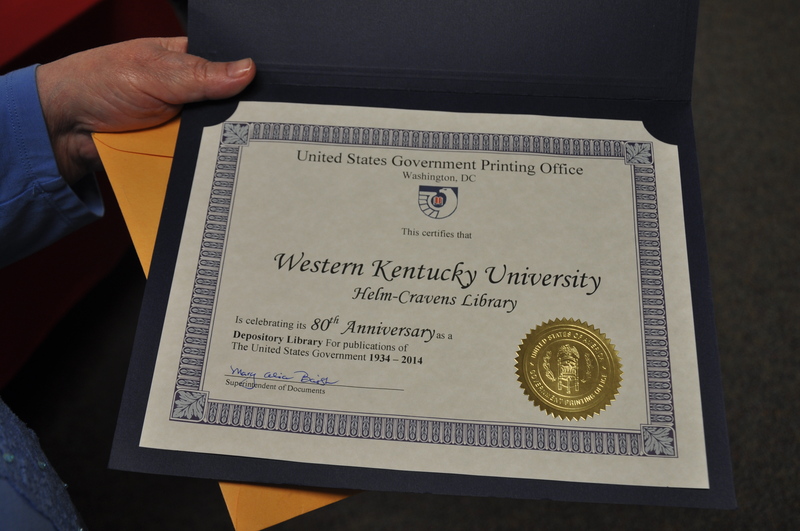 WKU Libraries celebrates its 80th anniversary as a United States Federal Depository Library this year. “Your long-term commitment to making Federal Government information available to the public is greatly appreciated,” said Mary Alice Baishe, Superintendent of Documents for the U.S. Government Printing Office. “Your partnership with the U.S. Government Printing Office helps accomplish a Government mission as well as meet your constituent service objectives. We look forward to working with you (WKU Libraries) and your staff for years to come as we all strive to provide the American public with free, easily accessible Government information.” WKU Libraries has been a designated Federal Depository Library since 1934. Go to http://wku.edu/library/dlps/gov_law/index.php for more information on the program. Come see our display case on the 5th floor of Cravens commemorating our currently employed & student Veterans at WKU! Thank you all for fighting for our freedom!!! Set up by: Paula Bowles, Amanda Hardin, and Debbie Lamastus. The following blog post is part of an ongoing series on the government documents collection. The government documents and law librarian at WKU is Rosemary Meszaros. Her office can be found in the basement of Helm Library, on the same level as the government documents and law collection. Government documents can be searched for using the library’s new OneSearch search interface. Simply type your topic into the search box and click “Search.” Once your results have been listed, you can refine your search to only government documents by choosing the options which contain “Government” in the location refinement options. When clicking on a listing for a government document, you will notice that the location is not formatted using the Library of Congress Classification System. Instead, it uses the Superintendent of Documents classification system, developed by the Government Printing Office (GPO). In it, documents are grouped by the government agency or department that published the materials. Major agencies are identified by an assigned letter and then further broken down by number into the subordinate offices. These are further broken down into series. D is the Department of Defense. These are all sub-departments of the Department of Defense. In the next installment, we will begin exploring the materials WKU’s Government Documents collection has to offer.